The Humidified Revolving Selector affords professional drafting technicians, engineers and artists instant startup and an efficient means of organizing and selecting pens. 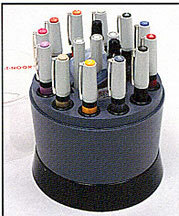 Humidified interior prevents ink from drying when points are stored uncapped point down in receptacles. Drawing points are exposed to the humid atmos within the unit, but not to the wetting agent, eliminating possibility of ink becoming diluted. HRS sets are available with 7 hard chrome stainless steel drawing points or 7 pen sets with jewel points for long life on drafting films. Each set includes an air tight Dry DoubleSealTM. Color coded caps, 3 pen holders, a bottle of Univ. waterproof black india drawing ink, a bottle of Rapido-Eze pen cleaner solution, board clamp and nib keys.